For this project my partner Jamie and I wanted to look into the UW Crush Scandal that had been going around campus. So the first thing I did was email our ASUW President, Brett Kahler. Brett and I set up a time to meet and conduct an interview that I could use for this project. After interviewing Brett, Jamie and I ran into a student in the Union and we felt it would be beneficial to get her perspective as well. We asked her a few questions about how she felt about the UW Crush Scandal. After doing this project I really enjoyed interviewing both Brett and Dyann. Both of these people were great sports about voicing their opinions. Some people we had asked did not want to get involved in the matter. I personally also like editing the video. I enjoyed making the youtube video and would love to continue posting and editting videos. On the other hand, there were some things I did not like. For instance, when Jamie and I first started asking people questions about the controversy some people let their opinions of the matter take over without being very objective. We found that they did not want to answer our question, but just wanted their opinions to be heard. Over the course of this project, I learned that I do enjoy covering news worthy stories. I like that our youtube video was posted on Buzzfeed. Knowing that my video could help someone learn more information about the UW Crush Scandal is a great feeling. The thing that surprised me most was that my video was put on a big website, such as Buzzfeed and people have, for the most part, liked my video. I wish I could have interviewed more people on the matter. I would have loved to have interviewed Meg Lanker -Simons on her thoughts about what she had done, as well as others involved in the scandal. I could see myself really using video in the future. I am interested in sports broadcasting; with the help of video editing I could possibly start my way up from the bottom with this skill. For the Social Media Project I live tweeted the University of Wyoming Swimming and Diving Banquet on Friday, the 26th. At the end of the season the Swimming and Diving Team has a Banquet up in the Wildcatter of the Football Stadium. The team dresses up for an end of the year celebration where awards are given out. As a team they reflect on the past year’s accomplishments. I enjoyed tweeting about this event, especially when the seniors were doing their farewell speeches to the team. I took a few quotes that I tweeted from some of the speeches. The speeches were very moving and inspirational to listen to and I was honored to get the chance to hear them. 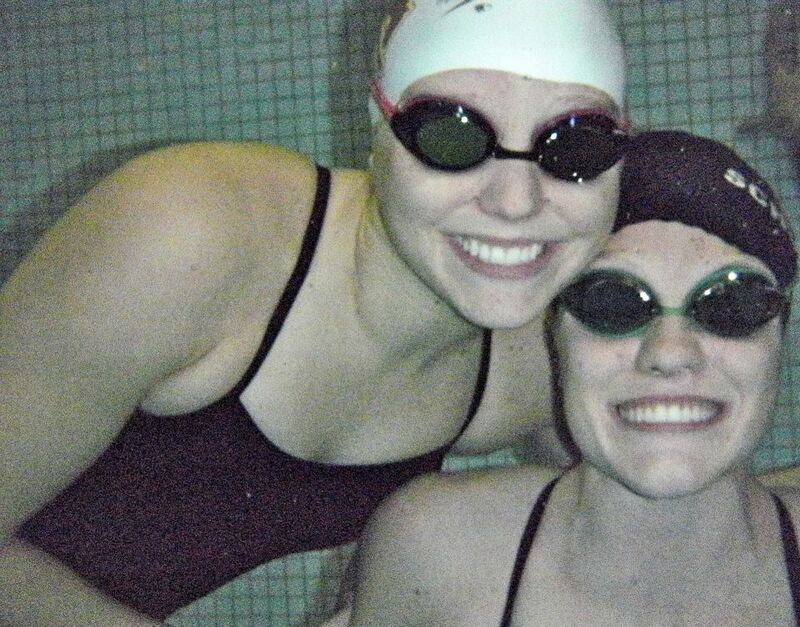 Also during my live tweeting, I had an alumni swimmer tweet me to get more information about the banquet. I thought that was very neat because someone was actually interested in reading what I was tweeting. On the other hand, I did not enjoy the meal that was provided. Each plate was a $22 meal and the meal was not impressive. I also did not like the length of the banquet. It started at 6 p.m. and lasted until about 10p.m. At the end of the night, one of the parents made a slideshow of pictures to showcase the team’s past year. The slideshow lasted for 45min which was a bit excessive. I learned that tweeting a live event is not easy. It was hard for me to listen to someone talking and get word for word what they were saying for a quote on twitter. However, I was surprised with how easy and fast it was to come up with ten tweets. I wish I could have picked a better event. I tried to be as objective as I could, seeing that I am a member of the Swimming and Diving team, but would have liked to choose a different event because of this. I could personally see myself using social media in my future in many ways. I was a member of twitter before this class. I believe twitter is a great way to get information out fast and without having to read so much. The purpose of this Soundslide Project, was to connect an audio story with pictures of a certain event. My partner Jamie and I choose to do a story on the Easter Egg Hunt put on for the Kids Club here at the University. The Thursday before Easter, Jamie and I went to the Easter Egg Hunt in the Field House on campus. Once we got to the event Jamie started to get interviews with some of the parents, children and Jackie Robins who ran the event. I on the other hand got to experience a whole different side of the Easter Egg Hunt then Jamie did. I took my camera and went out onto the football field with the children. As soon as the doors opened to go outside some of the kids took off running, so I ran with them. While taking pictures of this event I felt like for a while I was actually hunter for eggs myself, rather than just being there to take pictures. I found that the kids where very easy to take pictures of while they where busy hunting for eggs. They did not stop and look at the camera and pose for any pictures, however the athletes on the other hand liked to be ready for the pictures. As a photographer for this event I did run into some problems with this event. The lighting was awful for most of the event. The event started a 7 p.m., which meant that it was starting to become dark outside. This therefore caused bad lighting in the pictures. On the other side of this project was putting both audio and photographs together into Soundslide. This was a whole new different experience, I found this process hard and tedious. Trying to get the audio to match the photos at the right time to get the full effect of the event, was a challenging process. I would often times fix a photo to the audio perfect, but then all of the rest of the photos would have to change to match its audio part. Jamie and I did work together on the Soundslide project, which was very nice to have both of us working together to help one another. If I could change anything in our project it would be, the lighting during the Easter Egg Hunt and a broader variety of photos. I used the action mode on my friends camera, which took 40 pictures within about 2 seconds. I took a lot of photos but often found that in 80 pictures there was only two different pictures I could use in our project. Overall I did enjoy this project very much. I got to meet Jamie, who I had never talked to before in this class and we had a great time putting this project together. For this weeks assignment we were asked to edit our interviews from the past week. This experience was anything but easy. I had taken a class with Dr. Brown last semester about using the Audacity program, but I sure forgot all of what he had taught us in that class. The first problem I ran into was converting my file from an MP3 to a Wave file. I went online and looked up how to convert the files, which did help. The second problem I ran into was that every time I would hit undo in Audacity my Wave file grew bigger. Meaning my max volume was at the top and I did not know how to change it. This experience taught me that editing is not as easy as you think it is. Also, editing takes a long time to complete. You cannot just sit down in one sitting and expect to finish editing. The process takes more than one sitting and requires a lot of time and energy. However, I did enjoy getting to listen to my story in a new way. Having Mandy explain her story without my voice in the audio asking her questions all the time, made the interview more personal. The flow of the story is better captivated this way and I did enjoy that. I was surprised in how after taking the questions out of the stories how easy it was for me to make it sensible and flow together. That part did surprise me very much. I do wish I would have added in some ambient noise in the background, such as a school bell or something of that sort into the story. Also, in some parts I would like the transition of her answers to be more smooth, not so choppy and rushed into one another. For this assignment we were asked to record an interview with a friend or fellow classmate. Since I am constantly busy I chose to interview my friend Amanda Schumacher. With using a digital recorder I found this processes way more difficult than it should have been. The first time Amanda and I tried to start the interview we found we could not stop laughing at each other when we were talking. Also another distraction that happened while trying to record the interview was there were two other people in the house at the time the interview was being conducted. With other people at the house you can sometimes hear them talking or moving around in the background of the audio. In this process I learned that using a digital recorder is really nerve-racking. I did not want to mess up what I was saying or rush how fast I was talking. 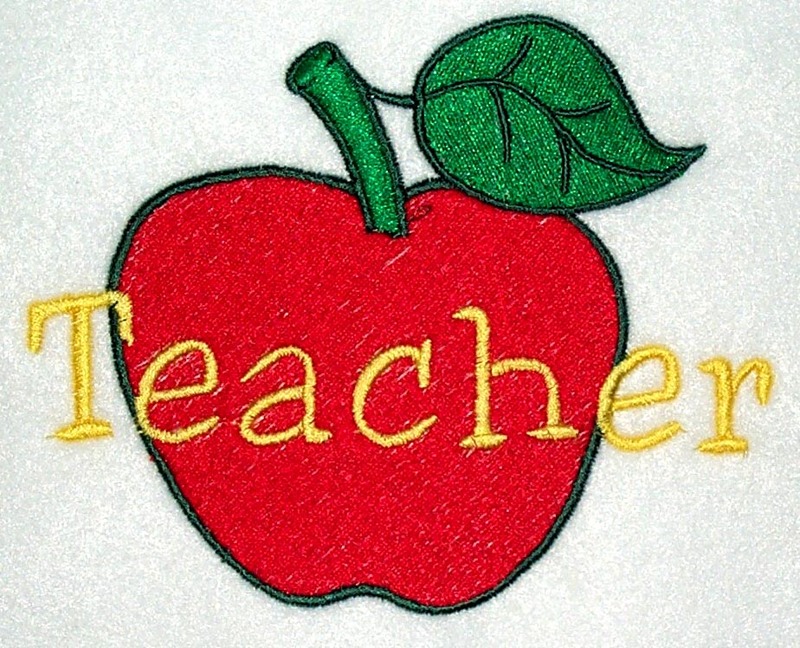 I did enjoy getting to know more about Amanda and what she does at the school she works at. However, I did not enjoy actually knowing the person. Since I knew Amanda I just found it hard to focus and take this assignment seriously. Which for me I want to take this seriously. In the future I want to interview someone I do not know so I will be able to conduct the interview with a more professional persona. For this assignment we where asked to gather some “Ambient Noise,” these are some of the noises I would like to share with you. 1. Plastic Bag- for this sound I was in my kitchen and I found a bag of Vanilla Wafers. I began to crumble it up in my hand for 10 seconds while I recorded the sound. I could use this sound in the background of a story that has to dell with some sort of trash. 2.Running Water- the second sound I recored was also in my kitchen. I turned on the water in the sink and listened as it bounced of the dirty pots and pans laying in the sink. I could use this sound in many different things, I would personally use it in a story about swimming so you could hear the water in the background. Make you feel like you are at a pool or by water. 3.Scraping Pan- the next ambient noise I recorded was me scraping a spatula over a pan for 10 seconds. This could be used in a story about home cooking. 4.Typing- in one of my classes I recorded myself typing on a keyboard. You could use typing for a story about a business job or something of that matter. 5.Tapping- also in the kitchen I took a spatula and a pan and tapped on it to make an interesting noise. This sound could be used for a news story involved with construction work. The tapping noise to me sounds like a hammer, which you could use in a construction story. 6.Outside- the last thing I recorded was outside of the Agriculture building. I was walking to class and I kept hearing a man shoveling snow, and also the snowplow in the background. I would find this sound very useful in a story about snow fall or the clean up snow. Payton Rose waiting to be feed a banana. This past week I got an opportunity to spend time with a 19 month old girl named, Payton; my neighbor had her over at her house when I stopped by. I could not resist staying there and taking photos of Payton and those green eyes. I cropped the photo because Payton was sitting on my lap while I was trying to feed her. This presented a very awkward angle and not steady at all to hold the camera.. My experience with Payton was quite fun, well for a while. Kids are great do not get me wrong, but without her mother there Payton started to cry a lot which made taking photos of her very hard. After she stopped crying she then started asking for a banana, I ran to my house and managed to find one. After receiving the banana Payton started to calm down and smile. The process of photographing her was difficult when she was constantly moving. Children have a hard time sitting still in general, I do not know why I would have thought Payton would be different. When I was taking photos of Payton I thought about what it would be like to have a “little Nikki so to say” running around sometime in the future. Which was fun to think about for about a minute when I realized you can not give the child back to their real parents. The creative devices that are used in this photo are cropping and experimenting. 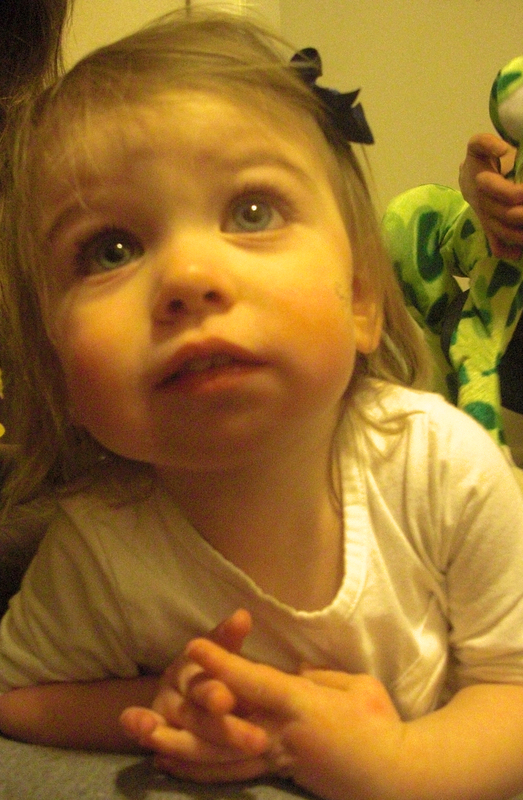 For cropping I cropped out most of the background so you could focus on Payton and her beautiful eyes. The experimenting came from taking the picture of her while she sat on my lap. 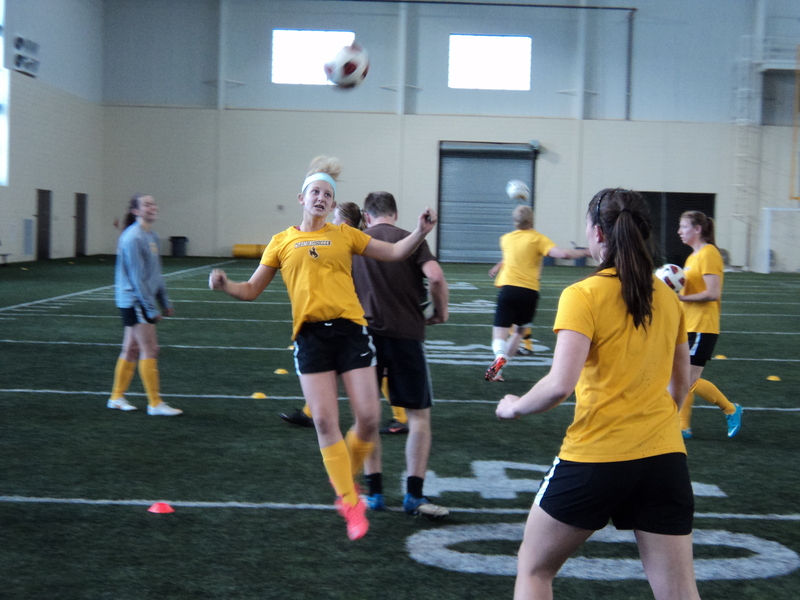 Wyoming goal keeper Abby Lindsay leaps into the air to block a shot at practice. Sporting events are always going on around campus! Whether theres a game, or a team in putting in the effort to make themselves better with practice. 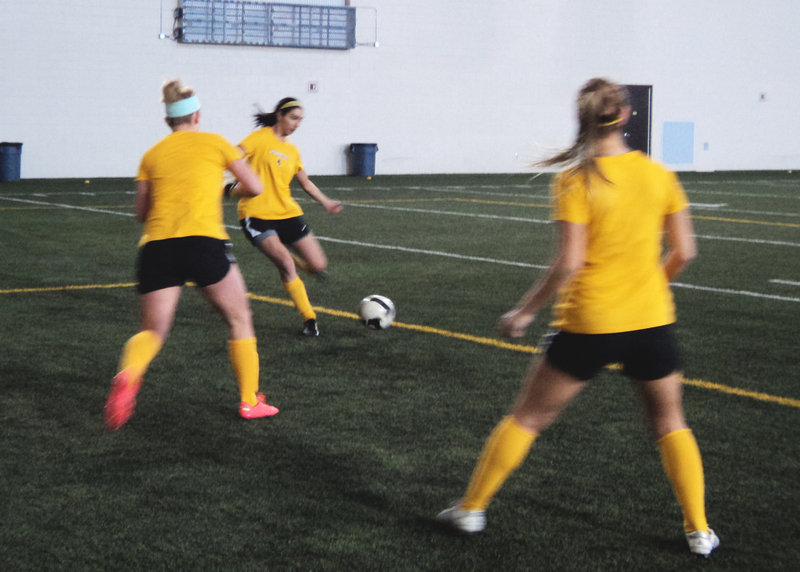 I observed that even on the off-season Wyoming Women’s Soccer Team are still in action. Although their season is only from August to middle of October the Cowgirls are still hard at work. I found out about this practice when I walked by the Indoor Practice Facilities (IPF) on my way to the Rochelle Athletic Center. I have started to keep my camera in my backpack just incase I see something to photograph. So I took out my camera and walk right on in. When I entered the IPF. I asked the Head Coach Peter Cuadrado if I could take pictures of his practice, he was an awesome sport about it and let me join right in. When I first got to the field the atmosphere was a little low. The team had just started their warm up and did not seem very enthusiastic about practice. However, after warm up the team started playing a game with six other boys, who were invited to play a mock game with the Cowgirls, at the end of practice were divided into two teams. During these fun mini games the teams were constantly yelling and screaming for one another to beat the other team. This was exciting for me to photograph, because I started to feel like I was on the field playing with both groups. I even found myself cheering for a team at one point. After the mini games came the real scrimmage. The boys that were invited to play were on one team while the Cowgirls were on the other. This whole process was very hard to photograph, because everyone was constantly moving. I often found my shots blurry a majority of the time. I also could not always be in every place at the same time. If one side of the field was seeing action I could not just run over to the other end and then run back with the players. I found myself sitting and waiting for something good to happen a majority of the time. The creative devices in this photo is Sports Action, the way Lindsay jumps up in the photo to grab the ball before a player tries to shoot it into the net. This shows the spirit of her team trying to capture a victory. 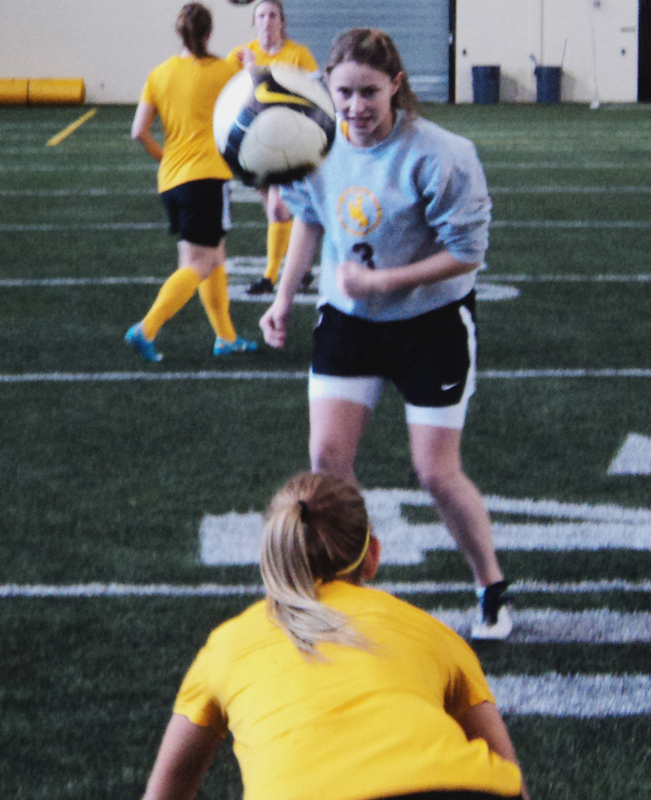 Cowgirl teammates Liz O’Reily and Jennifer Paul heading the soccer ball at practice on Thursday. This next photo was also taken at the Cowgirls soccer practice. I enjoy this photo because you can see on O’Reily’s face that the team was having a great time playing these games. This expressed an excitement energy on the field. The mini games were hard to take photos of because the girl were running all over to head the soccer balls. I almost got trampled a couple of times while trying to take photos. While photographing this event I felt competitive. I wanted to play with them and win. The creative device I like in this photo is a view-point. At this interesting angle I fell view-point expresses this photo the best. For my fourth photo this one was also at the Cowgirls soccer practice, as I mentioned both my experiences and atmosphere before they did not change in this photo. However, this photo was one of the luck shots I was able to capture. I was “in the right place at the right time.” I like this photo’s creative device as framing. As you can see in the picture two Cowgirls frame around Parmar as she kicks the ball towards the net. With the girls out to the side your attention is drawn right to the leg of Parmar as she takes her shot. Teammates Abby Lindsay and Abbey Armijo head the ball back and forth at practice this past week. My last shot was one of my favorites. This photo just as the four before express the same atmosphere and experience to me. This shot was by far one of the hardest for me to take though. I found this as I went through the photographs of the girls, which was difficult to take because the action shots always turned out blurry. This was one of the ones that did not. The creative device in this photo is focus. You can see both of the girls clear in this photo but the soccer ball and the background are somewhat blurry. I learned a lot from this assignment. It is not at easy at all to take action photos. The best thing I could have done was had a better camera that takes multiple pictures per second. What surprised me about the soccer shooting was that the girls were never phased by me taking pictures of them. They never changed their faces or anything to look better or worse for the photos. As I mentioned before I wish I had a better camera to use. Jordan Turner doing a start at practice early Monday. 1. For this first photo I wanted to show you the technique of framing. 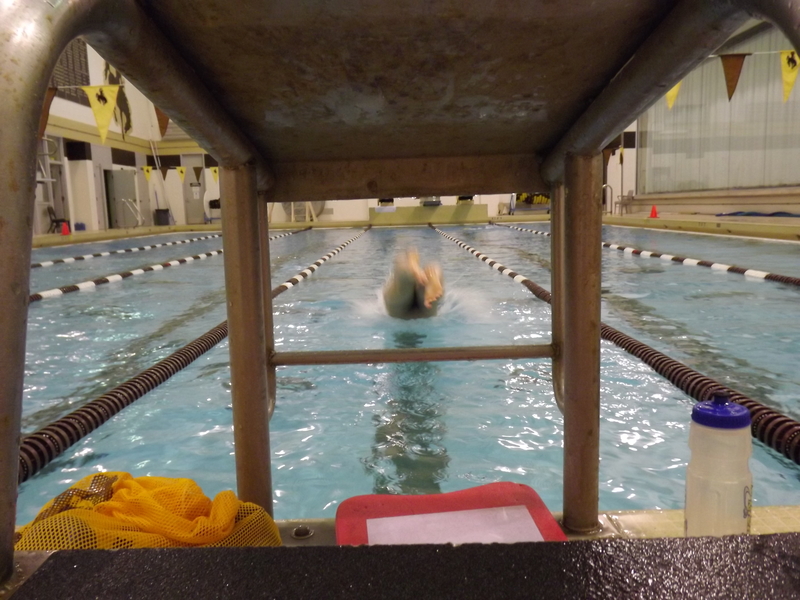 I went to a swim practice here at the University of Wyoming and was messing around with different angles and viewpoints, when I happened to take a picture at the right time. This photo expresses framing, which draws your eye directly to the center of the photo. The square in the middle of the starting block captures a swimmer right as he is diving into the pool. With framing you can clearly see that the main focus of this photo is on the swimmer diving into the pool, it draws your attention in. 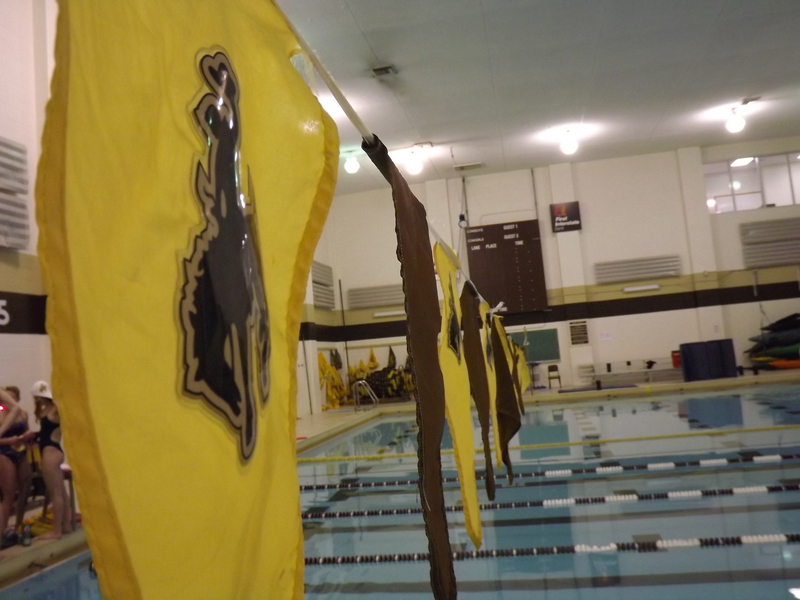 The flags at Corrvett swimming pool at the University of Wyoming. 2.While at the swim practice for the University I tried to look at things in a way that I normally wouldn’t. I needed to change my point of view from this just being a pool and people swimming in it to something different. I had to think outside the box and try new ideas. In this next photo I used the device of depth. The backstroke flags in this photo go completely across the pool. With this photo you can see how the flags go back into the picture to indicate its depth. Depth is also created by the focus on the first flag, which consistently fades the further away they are from the camera. The flags draw your eye into the background of the picture, allowing you to take in every element rather than just the flags themselves. The Mountain West logo taken from the 3-meter diving board at the University of Wyoming. 3. While I was walking around the pool I thought it would be a good idea to get some above the pool angles. So I walked over to the 3-metter diving board on the pool deck. After climbing to the top of the board I saw the Mountain West sign across from me, I then began to take some pictures from laying on the diving board. I like this picture for a low viewpoint, because this photo was taken at the level of the diving board, as if you treated the diving board as the ground. Because of the flat surface of the diving board, your attention is clearly focussed on the Mountain West sign. Claudia Carlson doing a turn at practice earlier this week. 4. This next photo uses the technique of cropping. Here Claudia Carlson does a turn on the wall a little too close to me. 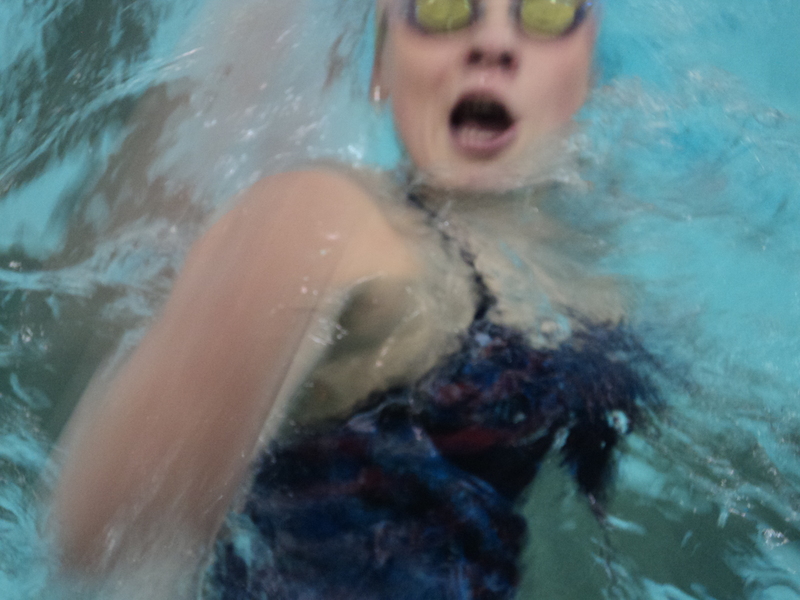 However I feel like this affect of cropping expresses the importance of breathing in swimming. The focus of this photo is her mouth, you may not have noticed this with a full body shot, you need cropping for this affect to be so clear. 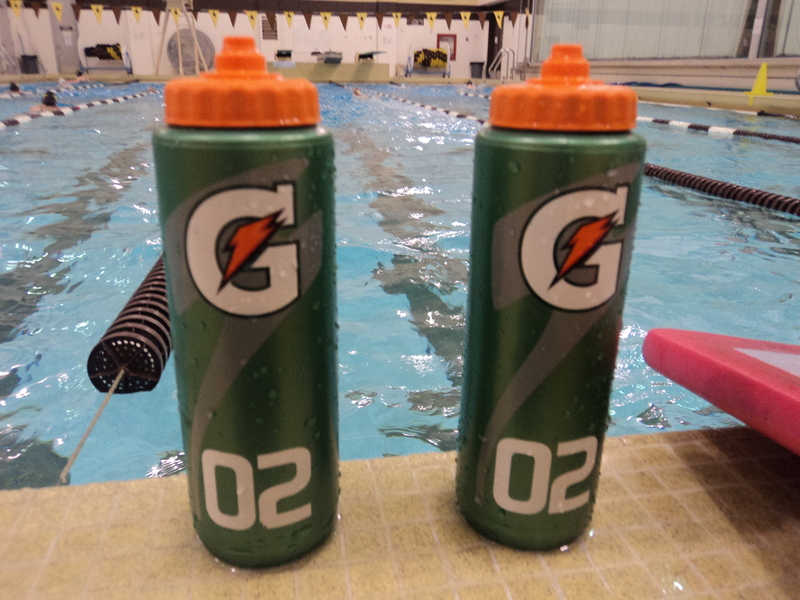 Two water bottles side by side at a swim practice. 5. This picture uses balance to create a sense that the entire landscape is filled. Had there only been one water bottle, there would have been a lot of empty space left completely to background. Instead this creates two focal points, drawing your eye across the picture as opposed to focussing on just one center point. This in turn creates movement that the picture otherwise would not be able to capture. After doing this experience I realized why you should photograph people you don’t know. During my experience all my team wanted to do was to pose for photos. I was surprised at how my pictures turned out without flash. I have always been a big fan of flash in photos, but for this assignment I did not use any flash. I wish I could have had a better camera for this assignment. I would prefer a camera that has the multi-shot(more then one picture with the press of a button). Overall I had a great time working on this assignment and would enjoy doing it again. UW Football Coach Dave Christensen probably wasn’t thinking about how his actions would impact recruits during the Wyoming vs. Air Force game. Coach Dave Christensen approached the Air Force Head Coach and started shouting obscenities and cursing. This controversial game sparked news stories across the country. 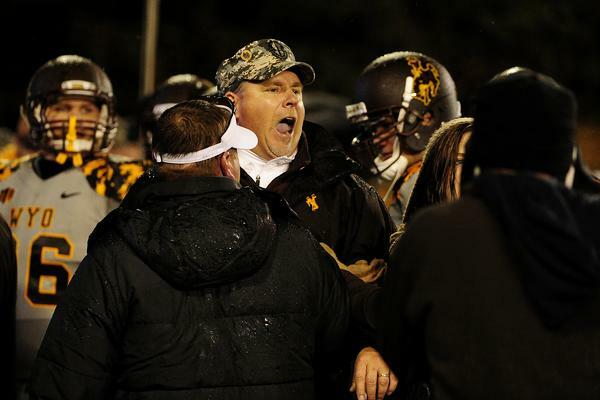 But the real question here is; does this video and outburst from Coach Christensen hurt potential recruiting for the University of Wyoming (Click to view video)? “Ethics is a big part of what Christensen teaches us. Hearing him say what he said to, of all teams, the Air Force, was just not the right move,” says Rains. After this video was leaked out to the media, Christensen had to pay a punishable fine of $50,000. He was also suspended for a week of practices and one home game. (The game Christensen was suspended for was Wyoming’s worst game of the year, losing to Boise State 45 – 14.) However, the damage that was caused after the video was released could not change the effect it had on other people. “I don’t think it affected us that bad,” said Rains. But now recruits always ask me, “What happened during that game and what am I getting myself into?” After this incident one can’t help but wonder, did this game affect Wyoming’s recruiting status for the following years to come? In response Miller says, “We average about 25 new recruits each year, this year we have recruited 21 new prospective athletes, for the upcoming 2013 season.” As a result of the games’ controversy Wyoming managed to still recruit several star athletes for this upcoming season. This past 2012 season, for the University of Wyoming Cowboys football team, started out with three consecutive losses. With these three losses you can’t help but wonder what is going wrong? After a season low of only four wins, many fans are wondering what is in the cards for next year? Recruiting can be a hard task for any school, but Wyoming has managed to strategize a new efficient way to approach this upcoming season in recruiting. “We recruited from 10 states this last year,” said Chris Miller, director of media for the Wyoming Cowboys. Most of the kids we recruit come from “Colorado and Texas”. 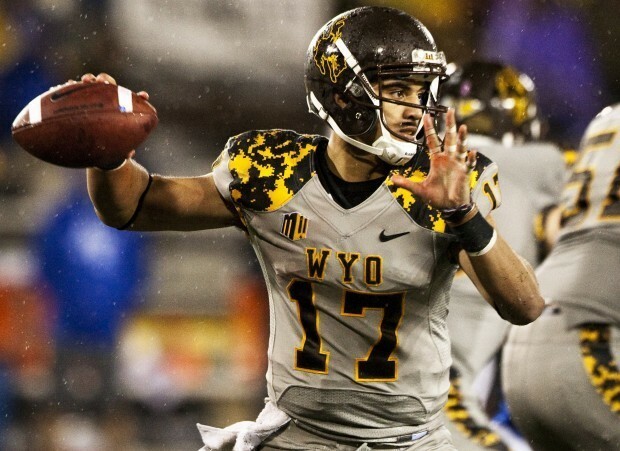 With this new approach, Wyoming is no longer just looking at recruits from surrounding states. Instead, the coaches are expanding their search for bigger and better athletes all across the country and world. coaches to avoid overlapping on recruits. This is also a more efficient way to manage time. For the coaches and staff, there is absolutely no time to waste. Having coaches recruiting in the same states runs the risk of overlapping coaches time with one athlete, when they could be spending time with other prospective athletes. By breaking coaches up in to different sections, this problem is avoided. Each year schools across the world bring in recruits to try and attract prospective athletes to come to their school. Here at Wyoming, our football team does a great job of making these prospective athletes feel welcomed. “We treat our recruits top of the line,” says Miller. When prospective athletes come on visits they don’t stay in the dorms with other athletes. Instead, these athletes are treated to a stay at the highly regarded Hilton Garden Inn. During the winter time prospective athletes get to ride on snowmobiles during the day, and at night each meal they have is paid for by the school. When taking recruit trips the prospective athletes want to feel welcomed and a part of the team. The recruits want to get along with the team and feel like they would fit in with everyone. With the new efficient way to expand recruiting across the world, we can expand our perimeters to evaluate more athletes. By continuing to recruit in sections the coaches eliminate the risk of wasting time and expand their list of more athletes. There may have been much to say after the Air Force game in 2012, however, as far as recruiting goes “there was no dramatic difference in recruiting after the Air Force game,” says Miller. My initial reaction to this website was that I liked the linking of the power cord throughout the whole page. This tied all of the stories together in a way that most sites can’t always do. However, after looking at the website I thought the style of each story became very repetitive and the information provided for these stories was too vague. Next up we have Mandy’s initial reactions. After looking at the site Mandy said the site was “very pleasing to the eye” and also liked how they showed the importance of coal production to people. The video links where something she liked and thought were very useful, but she felt confused by how all of the stories were going connect. To begin the next part of our analysis I went first on a 10 minute exploration in detail of the website. The first thing that caught my eye when going through this site was the story “Sometimes Its Hard To Get Away.” I picked this video because the photo was inviting. The second thing I clicked on was “Wyoming To Chicago” I thought this story was relevant and connected to my life here in Wyoming. The final clip I got to look at in the 10 minutes was “ It Gives You A Purpose.” I chose this story because it was closest to the top. Many of our observations of the site were similar, but Mandy was first interested in looking at the videos. She told me she is a “visual learner and prefers watching videos over reading informational text.” Mandy stayed very much in order of the stories going from top to bottom in that aspect. Although, she did click on the graphic about “Wyoming to Chicago” because she felt like it related to her (seeing that it had to do with where she is from). My favorite part of having Mandy do this experience with me was writing down the random things she would say while exploring the site. Some of the things Mandy said were: “these stories are playing with my emotions!” and “this is such an unbiased page. I was a little disappointed because I was hoping she would speak up more but she was too into watching the videos. As far as navigation goes on this website, I was not impressed. The videos definitely outnumbered the text. I mean, personally, I am all about videos, but this did make the website hard to understand. During my exploration of the site I also stumbled upon the contact information that linked the Coal page with “Powering A Nation”. This link was not a good example how you should link something from your page to another. It was not clearly marked and would be very hard to find for others. Also having more than just one page to share your information would have been helpful. In class we talked about keeping things short and not having to scroll down or up on a page too much. Linking some of the information to another page would have been helpful. Mandy also felt like the navigation was not up to her standards. She mentioned having to re-click on some of the graphic links in order to get them to play. The contact information was not easily accessible. I just happened upon the link to the website and this demonstrates a poor usage of linking without proper labeling. Mandy was unable to find the valid contact information. By looking at the bottom of the page she clink the contact link that just took her to a Facebook page. The three things I felt should be kept the same were: 1) That the site was unbiased. I felt that the website provided a good view of both those who support coal production and those who are opposed. 2) The amount of videos should also stay. I found videos the most informative. 3) The design of the page was neat and had to do with the topic. Lastly I would like to talk about the three things I would change. 1) There should be an introduction of some sort. I felt confused about what the site was even about at first. 2) Although I did like how many videos there were, I think it would be helpful to add a little more statistics/text to support each side. 3) A conclusion would have also been helpful.